Since its inception in 1990, DRAM technology company Rambus’s business model has been an unusual one, focused on the creation and licensing of technology as opposed to selling finished chips. It’s this emphasis on technology design and licensing that has led to Rambus holding a number of major DRAM patents, and also their resulting infamous legal fights with DRAM manufacturers over DDR technology. That said, with their legal battles settled earlier this decade we haven’t heard much from Rambus in the DRAM space as of late; after a run in the PC space with RDRAM and a design win in the Playstation 3 for XDR DRAM, the company has seen little success licensing further DRAM designs. Meanwhile with the DRAM market having unified behind JEDEC standards – DDR4, GDDR5, and HBM – Rambus’s influence has been limited to that of a smaller player, though one still holding a selection of major DRAM patents. As a result there has been some speculation over just what the future would hold for a company whose newer DRAM designs have been ignored. With the 2015 Intel Developer Forum kicking off this week we finally have the answer to that question: Rambus will be making the transition from an IP licensing business to a true fabless semiconductor firm, designing and selling their own products. For their entry into the world of chip design and sales, at this week’s IDF Rambus is announcing that they will be designing and selling DDR4 DIMM chipsets. The chips, which will trade under the R+ chipset family, will be for Registered DIMMs (RDIMMs) and Load Reduced DIMMs (LRDIMMs) for server usage, with Rambus producing both the Register Clock Driver (RCD) chip for RDIMM/LRDIMM, and the data buffer chips for LRDIMMs. As we have covered in the past, RDIMMs and LRDIMMs allow servers to expand the amount of memory they can address and to do so at higher speeds. By interfacing with an RDIMM’s RCD to better organize address and command signals, a CPU memory controller can handle more DIMMs and more memory per DIMM than standard unbuffered memory. LRDIMMs in turn take this one step further by attaching buffers to the data bus of each RAM chip on a DIMM – essentially changing DIMM bus operation to a type of serial mode – yet again increasing the amount of memory servers can address and the speeds they can work at. 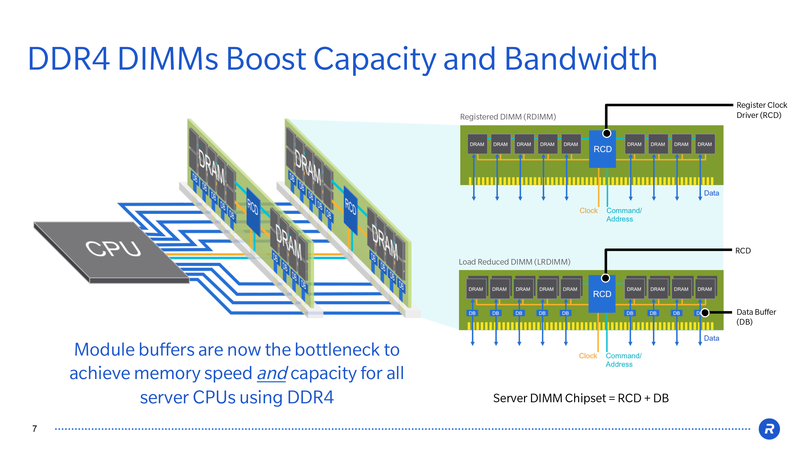 The tradeoff is of course DIMM cost due to extra chips, and depending on the configuration performance as well, but in return servers can accept far more memory than what a standard unbuffered bus would allow. 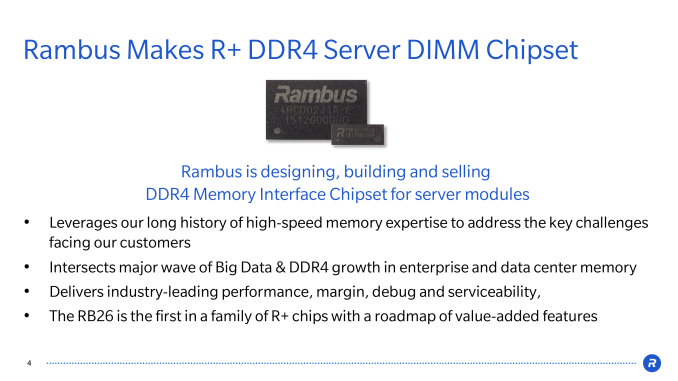 Rambus for their part sees a place for themselves in the current DIMM market for supplying the register and buffer chips used for DDR4 RDIMM/LRDIMMs, as DDR4 imposes further limitations in order to reach its greater speeds. This in turn is where Rambus is looking to capitalize on their experience with high speed memory, as they believe it gives them a leg up in producing DDR4 chipsets for both speed and reliability. The company’s first chipset, the RB26, will be compliant with DDR4-2666 specifications, and eventually Rambus wants to take it to DDR4-2933. Meanwhile, although Rambus is producing their own DIMM chipsets, they will not be producing their own DIMMs or DRAM. Rather the company will be offering their chipsets for sale to the DIMM vendors – Hynix, Micron, Samsung, etc – for those companies to use in building their respective RDIMMs and LPDIMMs. 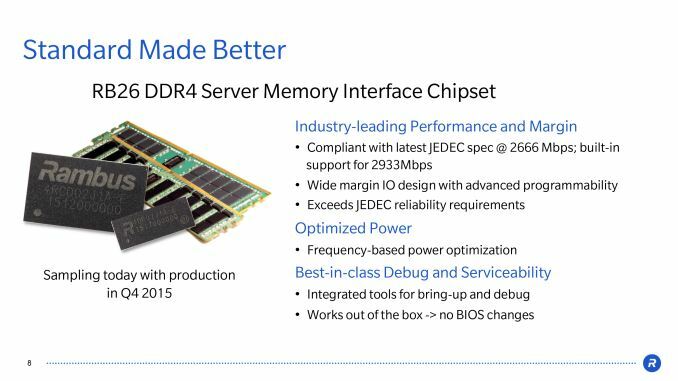 Ultimately such DIMMs would end up in the hands of server manufacturers and operators for their respective systems, with Intel’s latest Xeon processors being the catalyst. Going forward, Rambus is aiming to turn this into a regular business for the company. 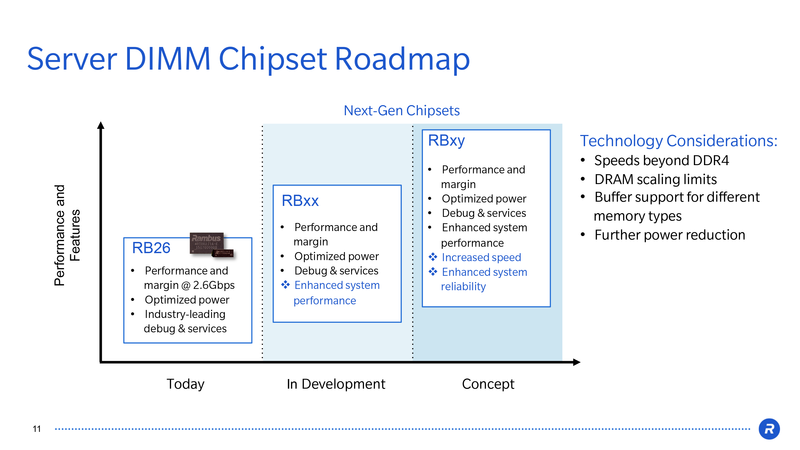 Besides the RB26 chipset, which is sampling low and will be in production in Q4, the company is also already in the process of developing future generations of chipsets to further boost performance and reduce power consumption. Finally, as for Rambus’s foray into fabless manufacturing, given the difficulties the company has seen in getting their DRAM technology adopted, the move into making chipsets for DDR4 is an interesting and somewhat unexpected one for a company who has traditionally only licensed IP, but also a logical one in their current situation. Though the company officially hasn’t thrown in the towel on their own DRAM standards, embracing the JEDEC standards rather than competing with them is the safer move given the momentum behind DDR4 and other standards. Meanwhile transitioning from pure licensing to selling their own chips is going to be a big – and undeniably risky – step for Rambus, but again owing to their background and history, it’s the move that makes the most sense as it means they aren’t wholly reliant on licensing to other companies to bring their designs to life, for all of the benefits and challenges that entails. JatkarP, C/A and CLK are received by a register, then retransmitted, left and right, to the DRAMs. Since the C/A signals have to be retransmitted on the next clock cycle, the latency is actually higher - the register receives on one CLK then outputs on the next CLK. It's the same as any other registered DIMM. RAMBUS is actually quite innovative. But by innovative, I mean niche and mostly unnecessary. RDRAM was like those 3-wheel motorcycles with the two wheels in the front (like a reverse trike) which is to say...why?